Greeting Cards, T-shirts and Tote Bags are availble for purchase by emailing Eileen Ormiston. Greeting cards of original watercolors are sold in packages of 6. The cards measure 6"x4.25" You can choose from the following 9 designs. Packages of 6 for $15. Cards of the same image or you may mix and match to make up your own selection of cards. Please add $4. for shipping for total order. Sales tax of 9% will be added to orders within California. Ladies 100% cotton T-shirts are available in Small, Medium and Large. 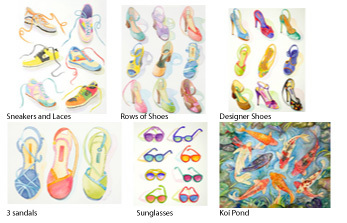 They are imprinted with the following watercolor designs. T-shirts are $20. each., Please add $4. for shipping for total order. Sales tax of 9% will be added to orders within California. 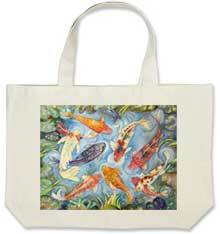 Attractive 100% cotton canvas tote bags, measuring 14.5"x18", come with the following watercolor designs. Tote Bags cost $20. each. Please add $4. for shipping for total order. Sales tax of 9% will be added to orders within California.